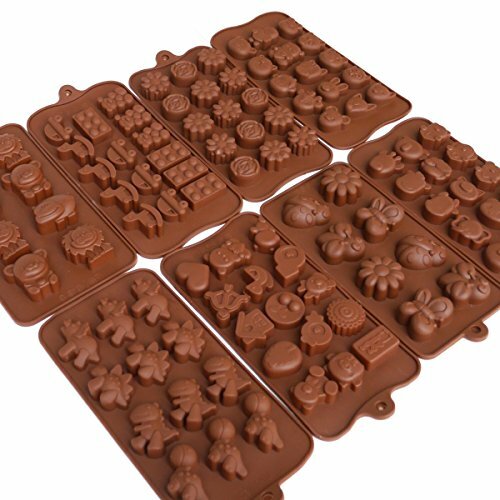 Are you looking for high quality silicone candy molds for your next party or event? Then you will want this 8 piece set. Perfect for Christmas, birthday parties and other occasions, or even if you just want your kids to have delectable desserts that look awesome at the same time. This mold set consists of various designs such as animals and flowers that you and your kids will surely love. This mold set works great with chocolate melts, is BPA free and meets FDA food safe regulations. These dessert and toy molds are kid friendly. Each tray has a unique design so the kids won't get tired of making various creations. These candy trays can also be used for creating popsicles, frozen goods, clay, play doh and even for making soaps and candles. It's never too late to start being creative. Try out these dessert and toy molds and bring out your artistic side. You'll be amazed by the numerous possible desserts and trinkets that you can make. This is an exclusive deal for getting a wide variety of cute animal and flower shapes in an 8 pack set. We are bringing this special deal to you because we are factory direct and can pass the savings on to you! EXCLUSIVE DEAL! Get so many unique shapes with this amazing 8 piece set and create beautiful cake embellishments that look great and taste great! MULTI-PURPOSE: You can make just about anything under the sun using this silicone mold set. From desserts such as cake tops, jello shots, popsicles and gummy candies to soaps, ice trays and candles, when it comes to being creative, this chocolate-colored set has got you covered. BPA FREE: These candy molds meet all FDA food safe regulations, are non-toxic silicone molds that are food safe. They are also easier to clean since silicone is non-stick and dishwasher safe. DURABLE: Molded contents easily come off with a slight push and the silicone mold will not break or crack. Designed to have a wide temperature range of -40 to 445F (0-230C) so it is safe to use in microwave, dishwasher, freezer, refrigerator and oven. SAFE FOR KIDS: Since this candy molds are made up of non-toxic materials, it can be used by people of all ages. Whether to keep them busy over Christmas and other occasions or just so you can have a quiet personal time, this pack set is the perfect way to go. If you have any questions about this product by Kitchen Divine, contact us by completing and submitting the form below. If you are looking for a specif part number, please include it with your message.